A week in to the 2015 season and so far so good! Fishing has been at least dependable with most Steelhead coming to egg patterns so far. Started seeing a little spawning activity around mid week, but cooler temperatures are forecast for the next several days and may slow the spawning process down. If you see these fish on redds, please let them be to do their thing! The future of our Brule Steelhead depends on the success of these spawning fish! As water temps warm, we should start seeing more action on Nymphs and swung streamers. 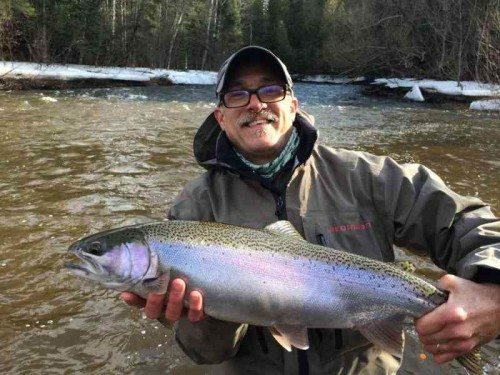 This entry was posted in Fishing Reports and tagged Brule river steelhead, RIO, sageflyfish, simms by Damian Wilmot. Bookmark the permalink.